The Warrior tanks have a lot in store for them in World of Warcraft: Cataclysm. From the introduction of the new and simplified stat system, the new Rage Normalization system, and of course some new and revamped skills and abilities; our classic Protection Tanks have new challenges to face when the 3rd installment hits the stores. Ever since the Wrath of the Lich King and arguably even in the Burning Crusade expansions, Warrior tanks have somehow lost their uniqueness of being a heavy duty threat generating, aggro holding toons. Imagine almost everything a Protection Warrior does can be done by other tank types, and in some cases, they do it even better! It’s like this class has become the underachiever sibling in the tanking family! In Cataclysm, Warrior tanks will either get an answered prayer or a nightmare come true depending on how you’ll look at it. Ultimately, it all boils down to how well the person plays the Protection Tank and how to manage everything in the expansion. Step up and listen now as we give a short discussion on the changes Warrior tanks will have to face. Stamina will now be improved in every gear giving you more health to abuse in the face of danger. This change is excellent since it gives healers little less to worry about in maintaining their targets in shape. But wait a minute, why does the hunter almost have the same health points with the tank?! The priest, too?! Did the tank miss a buff? No, you’re not dreaming buddy. The Warriors, or heavy geared class or tanks, aren’t the only ones having an improvement in gear Stamina, but also the other classes too. Yes, mail, leather, and even cloth will have improved Stamina bonuses that allow them to proportionally have the same health points as to that of a Warrior, or a tank. Kinda makes tanks a little less valuable, huh? We might expect to see less tanks in groups or raids if this is true. But I suppose Blizzard will make adjustments to bosses and other NPC enemies, so all hope isn’t lost. Block Rating is also getting a revamp. Instead of the amount of damage blocked depends on the gear, Blizzard opted to standardize the rating to 30%. This ain’t half bad because it means the more damage an enemy does, the more damage the Warrior tanks can block. Parry Rating will also get a make-over. Instead f getting damage, the parried attack and the succeeding attack will be reduced by 50%. Mastery is a new addition to the roster of stats. Though there is no word from Blizz on how exactly will it work, they gave us an idea that when you’re specialized in a specific talent tree, you will get stat bonuses from the corresponding tree. Meaning we might see some Stamina and Armor bonuses for our Protection Warriors. This might answer the issue of Stamina leveling in the stats. Warrior tanks are a little more important now again, yay! Protection Warriors will be having improved abilities along with new ones when Cataclysm starts devouring most of our lives. And what do we need when using abilities? Rage! Rage generation has now been normalized. This means no matter how hard you hit or get hit, you will receive the same amount of Rage for your rage bar. This gives the Warrior tanks something to consider when doing their skill rotations in holding aggro. Warrior Shouts will not consume Rage anymore and will have the similar effect of a Death Knights ‘Horn of Winter’. Plus, Shouts will generate rage in the process. Among the new abilities, Warrior will learn Inner Rage (81), which can increase the damage output by 15% and Rage consumption by 50% if the Rage bar is full. Gushing Wound (83) which puts a bleed debuff on a target which can be stacked up to 3 should the target move. Heroic Leap (85) is a Protection tank’s new best friend. It allows the Warrior to leap towards the target and apply Thunderclap to nearby enemies. Protection Warriors should have fun with this as it adds another option in approaching mobs and generating threat as soon as possible so that DPSers can hit hard fast. 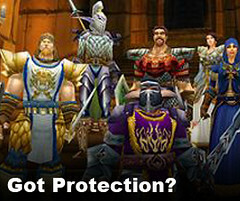 Overall, Protection Warriors have a lot to consider when entering Cataclysm. Possibly the most frustrating part for them is the Stat alterations which allow non-plate users to have the same health as to those with plate wearers. Threat generation, skill rotation, and Rage management can be more effective than the previous expansions as long as the player knows how to play it well. These 3 are the Protection Warriors main arsenal in hopes of staying at top of the tanking world compared to other tankers. They need to step up to the plate and tank hard or else, we might see a group where DPS and Heals are the only players they need. EPIC WIN for Hunters! Previous Post Tankers Get Ready for Cataclysm! Now that the patch hit, and we got a better glimpse of what tanking as a warrior will be in Cata, I’m not sure what’s going to happen. I’ve read a lot of veteran prot warriors saying that newer prot warriors will have a hell of a time getting ahold of the new mechanics. Well, I’m fairly green, started a few months ago, and I was used to tab-cycling through targets with devastate and revenge whenever it procced, on top of plentiful thunderclaps. But the last few days I’ve been having a pretty hard time keeping aggro off of DPS on group pulls (specifically, boomkings spamming hurricane) I think maybe I’m doing something wrong? I’m only level 78, but I figure, last week it was going pretty well and now I feel like a total noob, heheh. Any pointers? Also, I feel like the hotbar can’t fit all the stuff I need now, heheh. Rend, for example, was an afterthought. And I hardly used heroic strike because of the wait. I’m also hearing a lot about the ability queues, and while I did feel a certain small ‘ lag’ but I was still getting used to the UI so I dismissed the nagging feeling. Anyway…ideas? comments? Is anyone else find problems with Challenging Shout and Vigilance (Specifically how it refreshes Taunt) since Cataclysm came out?